After my siblings and I returned from trick-or-treating, we dumped our candy on the floor so our parents could inspect our haul. We’d be allowed to eat a piece or two that night but were usually sent to bed because we usually had to drag ourselves out of bed the next morning for school. I don’t think any of us ever missed school on November 1st due to a tummy ache, but I’m sure there were plenty of times that we were were late. And I can remember at least once when my blonde hair wouldn’t release its death-grip of spray-on “temporary” hair color. “Washes out with normal shampooing” can sometimes mean “it will fade after two weeks regardless of what you try.” Did you know that you can actually stain blonde hair? You can! Where are the Butterfingers? I know we had more peanut butter cups than this. What happened to all the little Snickers bars? Where’s all the good candy?! Bad candy stayed in the top of a round plastic cake carrier, inverted, since it was the biggest, unbreakable bowl-shaped item in the house. (Bad things can happen to nice things when there are 4 pairs of hands scrambling to access its contents.) It disappeared over the course of the next couple of weeks. Frost the cupcakes and smooth the surface with an offset spatula dipped in hot water (don’t get carried away with this, you’ll be late to the party!). Tint the reserved frosting red and pipe onto the surface, from the center branching outward. I used a #4 tip but I think a smaller opening would have been even better. Place a Lifesaver in the center (the side with “Lifesaver” printed on it should be face-down), and pipe a little bit of frosting into the hole to hold the mini M&M in place. Voila! 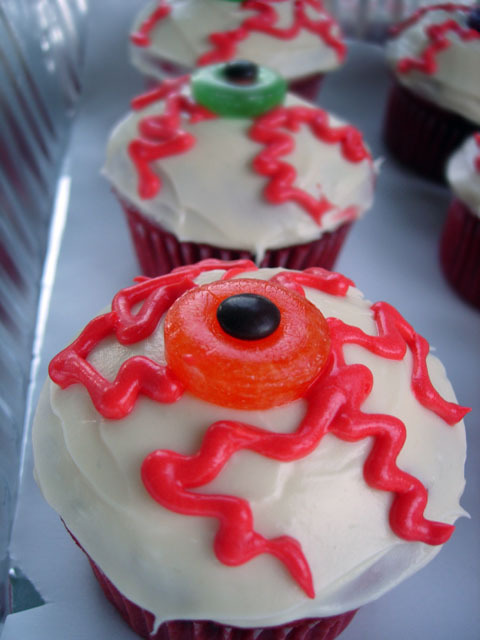 Eyeball cupcakes. One BIG advantage of going to Catholic school – Nov. 1 was a holiday – no school, just candy and after halloween recovery! Those are so festive, I love em! Those are so cute!! 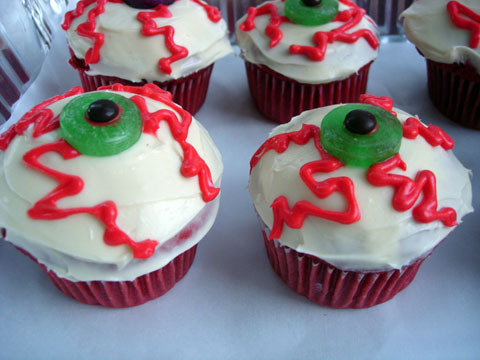 I’dlove to make these for our Halloween potluck this Wed. but I don’t know if I’m that talented with frosting! lol! these look great! I have actually never baked anything for halloween and was considering doing it this year. my husband would be thrilled. My daughter and I made the red velvet cupcakes last night and are frosting them tonight. 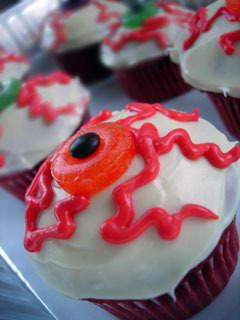 We are making the cream cheese frosting home-made, but using store-bought red gel kind of icing (in a little tube) for the blood vessels, gummy lifesavers for the irises and mini-m&m’s for the pupils. Would you be able to post the recipes you used for the red velvet cupcakes and cream cheese frosting. They look so good! Jen – Sure thing! I’ll post both recipes by morning. im trying this for my first halloween party im throwing (im 12) and thank for the idea!!!!! !